Home Agriculture Conservation Conventional Farming Cover Crops Farming Green Manure IPM No-Till Nutrition Organic Farming Soil Food Fight: Organic or Conventional? Food Fight: Organic or Conventional? This week a study from Stanford University created quite a buzz about our food and our food supply system. The study published in the Annals of Internal Medicine was entitled: "Are Organic Foods Safer or Healthier Than Conventional Alternatives? : A Systematic Review." (Smith-Spangler et al, Ann Intern Med. 2012;157(5):348-366). The authors looked at 45 years worth of published research comparing the nutritional differences between the two farming systems. The crib notes version of what they found was that there was no significant difference in nutritional value between organically produced foods and conventionally produced foods. My purely anecdotal conclusion from my own farming operation would concur with the results of these reviews. The nutritional value of what you eat is a direct result of the quality of the soil it is grown in. The soil quality is not dependent on a "farming system" ie: organic or conventional. Soil quality is contingent on the care and stewardship of the farmer farming the land. Care and stewardship are not "farming systems" but philosophies that work within both farming systems. Care and stewardship are not mutually exclusive to conventional farming. Visit a family farm and you will discover quite the opposite is true. Soil condition and quality is a direct result of care and stewardship and will reflect the nutrients of that care and stewardship, as well as the nutrients that are inherent to that particular soil type. If a soil is low in boron, the food grown there is likely to be low in boron. If a soil is high in iron, the food is likely to be higher in iron than food grown in iron deficient soils. There is a direct correlation between the nutrients in the soil and the nutrients in your food grown from that soil regardless of whether that farmland is organic or conventional. Wikepedia defines organic farming as "uses a variety of methods to improve soil fertility, including crop rotation, cover cropping, reduced tillage, and application of compost. By reducing tillage, soil is not inverted and exposed to air; less carbon is lost to the atmosphere resulting in more soil organic carbon. This has an added benefit of carbon sequestration which can reduce green house gases and aid in reversing climate change." Crop rotation - yup we do that. We do that so that we build up the soils and reduce the likelihood of pest resistance by repeatedly planting the same thing in the same field year after year. See this field of edible/tofu soybeans? Last year it was planted in corn. Next year it will be back in corn or hay or tomatoes or green beans. We rotate our crops annually. Always have. Always will. Period. Conventionally. 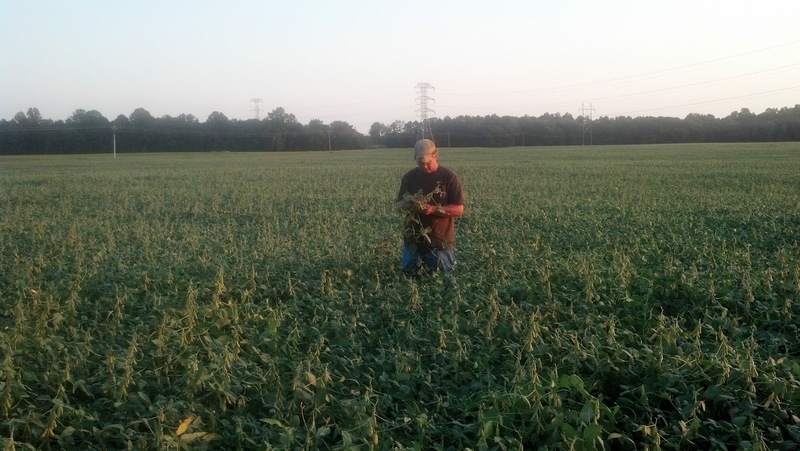 Green manures & cover crops - yup, we do have and have for 40+ years. Typically we plant cover crop wheat or rye. If we are looking to build up our soil fertility and tilth, we plant a mix of Austrian snowpeas, rapeseed, and crimson clover. If we are looking to break up compaction and tight soils, we plant tillage radish which you may also know as the Japanese delicacy Daikon radish. My husband says tillage radishes produce the most "mellow" soil. That's farmer terminology for really good soil quality. We plant the type of cover crops and green manures that the soil tells us it needs. Always have. Always will. Period. Conventionally. No-till/conservation till - yup, we do that. Good gosh this picture is older than I am and what a cutting edge contraption it was in its day. As I said in my last blog, this was a HiBoy cover crop seeder for no till planting. 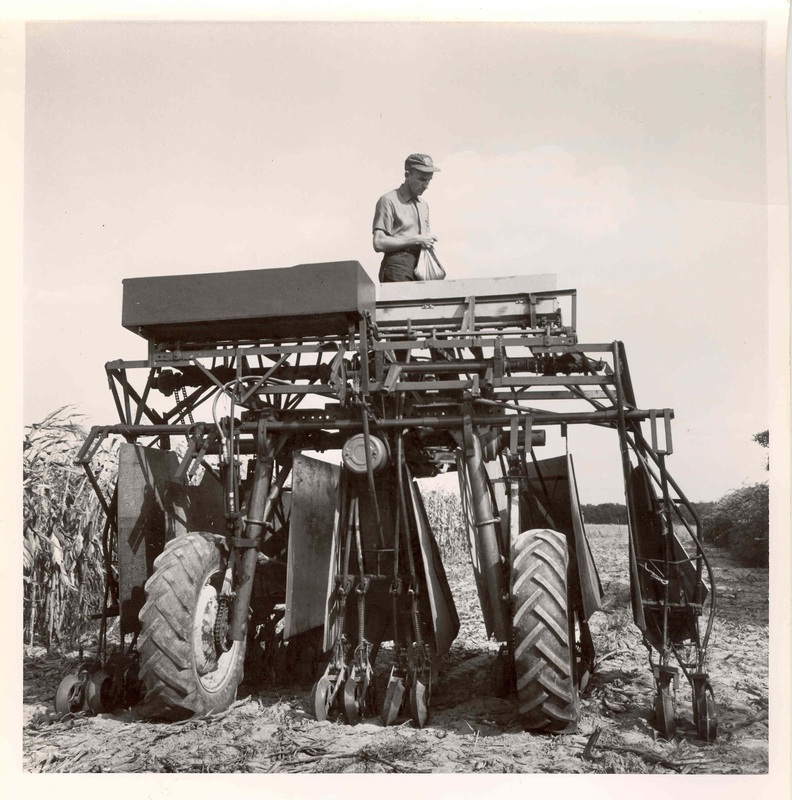 A practice started nearly 2 generations ago on our farm. 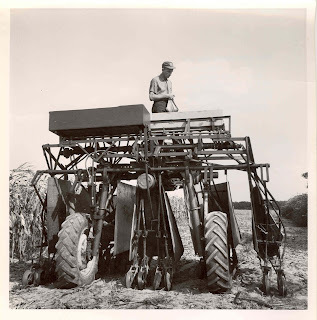 In this more current picture above is of the Comptroller of Maryland getting his first lesson in tractor driving, pulling a No-till ripper. He came for a visit so we taught him how to drive a tractor. No-till ripping is a conservation practice that breaks up the soil compaction 12+ inches below the surface with minimal surface soil disturbance. Disturbing the soil surface creates the conditions for erosion. As land stewards, we want to keep our soil intact and in place so we do as little cultivation and tillage as possible. Integrated Pest Management - yup we do that. IPM is simple common sense practice. Essentially, you scout a crop looking for pests, whether insects or mildew or disease. IPM means you look for a certain level of disease or pest, also known as a threshold, choosing not to treat the problem if its below a certain threshold, or treating the problem if it reaches a higher threshold. 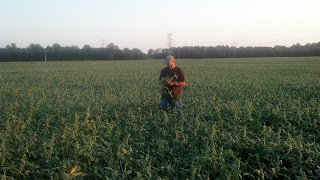 Here my husband Hans is scouting soybeans looking for ear worms and stink bugs both of which attack the soybean pod and damage the crop. When we choose to spray, we may use an organic pesticide, or we may use a synthetic pesticide, it all depends on the level of the problem and the best way to correct the problem. When we do spray, we spray judiciously, using EPA approved organic or synthetic chemicals according to their label and making sure that the proper pre-harvest interval is followed so that no excess pesticide residue from either the organic or synthetic chemicals we use, remains on the crop. So back to the food fight. We as conventional farmers practice very similarly to organic farmers. It is our goal to be constantly improving our soils through the many practices that are often credited to "organic" farming systems. We adhere to the pre-harvest intervals so that our buyers can trust the foods that we grow do not have unsafe levels of residues. As I've said in numerous blogs, my kids eat what we grow, and they are of utmost importance to me. If I wasn't comfortable feeding them what we grow, then we wouldn't farm the way we do. There is not a food fight between us as farmers. We have good friends and neighbors who are certified organic. We all get along which is why it amazes me that this choice between organic and conventional is so polarized amongst consumers. As a farmer, I want you to support farmers of all kinds. If you choose organic foods, your supporting a farmer. If you choose conventional foods, your supporting a farmer. As a dietitian, I want you to eat healthy foods and know that you can do so from both organic and conventional. Despite the media frenzy around the study, I don't think this really is a food fight. It is your choice as a consumer and we are fortunate to have as many safe and healthy food choices as we do thanks to all the American farmers, organic and conventional.